So you have decided to have a large outdoor event at your house and now you need to know how to provide food for everyone. No one wants to be hungry and cranky during a party, therefore it is your job to make sure that all of your guests are properly fed. Before you start to think of a menu, the most important thing to ask yourself is: How many guests are you planning on having? This simple question should, in my opinion, decide what type of menu you will be having. For a larger party of approximately 50 to 100 people, the most practical menu is a classic barbecue menu, with slow-smoked pulled pork, smoked kielbasa sausages, and appropriate side dishes. For a smaller party of approximately 20 to 30 or so people, the more typical cookout food can be served off of your backyard grill. So ask yourself: How many guests will I be having? You can easily cook for 20 to 30 people right in your own backyard by using your grill. The goal is to offer a menu that is not only easy to pull off, but will also be a tasty, memorable event. By serving a gourmet guacamole burger alongside a tender and juicy bratwurst sausage with homemade blue cheese coleslaw, you will have people begging for more. All you need for this type of cookout is one typical backyard grill – charcoal or gas. In addition to the ingredients mentioned below, you will also need about 15 to 20 large aluminum tins and aluminum foil. One tasty menu for a smaller cookout includes a gourmet burger topped with guacamole, juicy bratwurst sausages, and blue cheese coleslaw. These three items are the heart of the menu and can be accompanied by any other simple dish you would like, such as baked beans, potato chips, or anything else you can quickly and easily purchase. Assuming 30 quarter-pound burgers, you would need 7.5 pounds of ground beef. It is smart to aim for 35 burgers, in case a few people love them, or in case you drop a couple. Therefore, purchase 8.25 pounds of ground beef to be on the safe side. For the bratwursts, pick up approximately 40 sausages. This means that you need about 35 hamburger rolls, and 40 hot dog or sausage rolls. Prepare the blue cheese coleslaw in a large bowl the night before your party. Cover the bowl with plastic wrap and place in the refrigerator. You can also prep the burgers the night before your party. Loosely grab quarter-pound handfuls of ground beef and very lightly form into a burger patty. Lay burger patties in an aluminum tin and cover with Montreal steak seasoning. Liberally sprinkle Worcestershire sauce all over the burgers and cover tightly with aluminum foil. Place the aluminum tins in the refrigerator overnight. Two or three hours prior to your party, prepare the fresh guacamole. Store the guacamole in a large bowl covered tightly with plastic wrap. The general plan for cooking this menu is that the bratwurst sausages will be cooked first on the grill and then wrapped tightly in a large aluminum serving tin. After the bratwurst sausages are grilled, the burgers are placed on the grill. The reasoning for this is that sausages hold their heat for a long time when covered. They are also very fatty and juicy, which means they will not dry out. About 45 minutes prior to your guests’ arrival, prepare your grill for a medium or medium-high heat. Grill all of the bratwurst sausages, flipping after a couple of minutes over direct heat, and place the cooked sausages in the aluminum tins. This should take about 30 minutes. For a charcoal grill, add a little bit more unlit charcoal to keep the heat source going. When your guests start to arrive, cook the burgers in two or three waves. Depending on how hungry people are they might eat immediately, or wait a few minutes. Cook 10 burgers and place them in an aluminum tin. Then cook 10 more burgers and place them in the tin, and finally cook the remaining burgers. Place the aluminum serving tins next to the rolls and fresh guacamole. Your guests can make a gorgeous large plate with a guacamole burger, a bratwurst sausage, a huge heap of blue cheese coleslaw and whatever other purchased sides you would like to include. The easiest way to have a successful cookout for a very large amount of people is to serve low-and-slow barbecue. Economically, this is smart because you can find 10-pound pork shoulders for under $20. For this many people, you would plan on 4 to 6 approximately 10-pound pork shoulders. I also like to smoke Kielbasa sausages and cover them with barbecue sauce to serve along with the pulled pork. To cook this type of barbecue, you will need a smoker, such as an ugly drum smoker. In addition to the ingredients mentioned below, you also need about 20 to 30 large aluminum tins and aluminum foil. This barbecue menu involves 4 to 6 approximately 10-pound pork shoulders, approximately 50 kielbasa sausages, and approximately 100 to 150 sandwich rolls. The pulled pork will be split and covered in two different types of barbecue sauce and served on sandwich rolls. The smoked sausages will be sliced into one-inch-long pieces and covered in barbecue sauce. On the side, serve homemade blue cheese coleslaw alongside of any purchased foods such as baked beans, potato chips, and cornbread. The day before the party, light the smoker for a 250°F heat. Add any type of smoke wood that you prefer. Liberally apply your favorite barbecue dry rub to all of the pork shoulders. Add the pork shoulders to the smoker and smoke for approximately six to eight hours. After the six to eight hours, wrap the pork shoulders tightly in foil, move to a baking sheet in a 250°F oven, and continue cooking until the internal temperature is approximately 200-210°F. After the pork shoulders are in the oven, add the Kielbasa sausage to the smoker and smoke until the internal temperature is at least 165°F. Afterwards, remove the sausage, let cool, and slice into one-inch-long sections. Place the sausage in a large aluminum tin and cover with the tomato-based barbecue sauce. Wrap tightly with aluminum foil and place in the refrigerator overnight. After a few more hours, the pulled pork should be at appropriate temperature. Remove the pulled pork from the foil and the oven, and let rest uncovered for at least 30 minutes. Using two large forks, pull all of the pork shoulder into pulled pork. Place half of the pulled pork in aluminum tins sauced with vinegar sauce, and place the other half of the pulled pork in aluminum tins sauced with the tomato-based sauce. Wrap the foil tins tightly with aluminum foil and place in the refrigerator overnight. Prepare the barbecue sauces and blue cheese coleslaw one or two nights prior to the party. An hour before the party, reheat all of the aluminum tins (still covered with aluminum foil) in a 300° oven. All of the tender barbecue meat is smothered in barbecue sauce and will not dry out when reheated. Once all of the meat is reheated, serve your guests directly out of the aluminum tins. Your guests can make a plate with a delicious pulled pork sandwich, smoked sausages, blue cheese coleslaw and any other purchased side dish you wish to add such as corn bread, or baked beans. The night before either-size party, fill multiple coolers with ice and fill the coolers with cans or bottles of your favorite beverages. Include a wide variety of beers, sodas, and water. The beverages will be ice-cold after sitting in ice overnight. The most important question you need to ask yourself is: How many guests will you be serving? A smaller cookout can easily be handled on a backyard grill, serving your guests a gourmet burger and a simple delicious bratwurst. However, a larger cookout requires much more preparation and an entire day of slow-smoking barbecue meats. 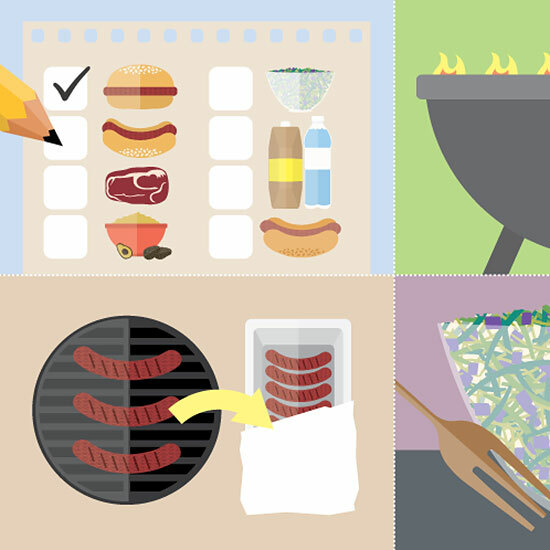 No matter which type of cookout you plan on having, following the above instructions will set you up for a successful party: everyone will always want to come back to your house for the next get-together.